Vikings customers may purchase the Vikings Reward card at a price of P50 per card and download the Vikings Reward Mobile App for FREE. Customers must input up-to-date details about the member during on-site registration. If card has remained inactive, this would mean non-earning of points, for 12 consecutive months will result for non-renewal and cancellation of Vikings Reward Membership. Enrollment process and membership eligibility is subject to Vikings’ prescribed criteria. Vikings will resolve any disputes or questions raised regarding the eligibility for membership of Vikings Reward Program at its sole discretion. The Vikings Reward Program is Vikings’ way of recognizing and rewarding its client’s loyalty patronage to the company. Each membership tier has it’s own set of perks and privileges. The higher the tier level, the more benefits the member will get. Members can earn 1 Reward and Redemption point for every P100 spent by dining at Vikings and it’s affiliates and subsidiaries. The Vikings Reward Card must be presented in every Vikings transaction in order to earn points. If card has not been presented, then member will not be able to earn points and can’t earn it on any day after dining. 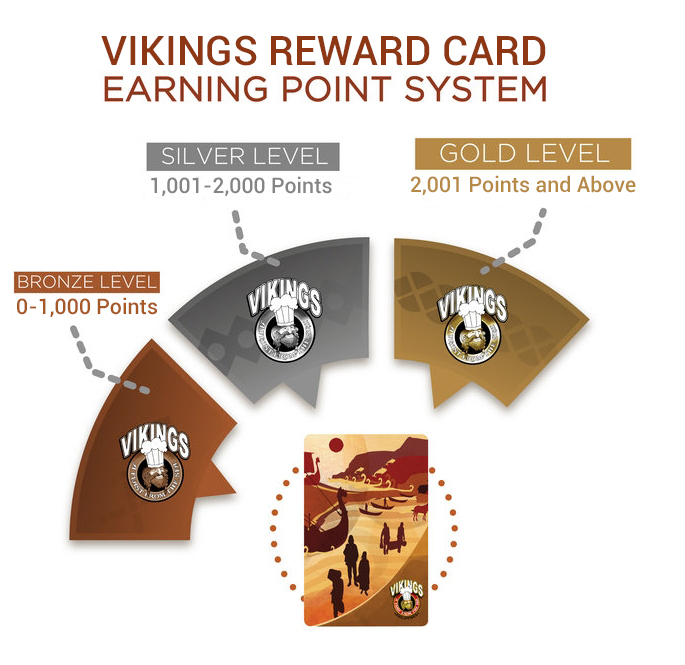 Points earned for the Vikings Rewards Card will go to both your Rewards Points and Redemption Points. Rewards Points are earned for status (Bronze, Silver and Gold) upgrades, while Redemption Points are earned for redeeming dining and other rewards. Vikings reserves the right to change or adjust points earned or accrued without prior notice or consent to its members, as it sees fit, but not limited to, deduction of points from Vikings resolution of disputes and/or from over-crediting or mis-crediting of points. In which case: - Vikings will make the necessary change in points or reversal of points that was erroneously credited the member’s account but not yet spent or used by a member. - In the event that the erroneously credited has been spent or used by the member with or without knowledge, or in the event that the member does not have enough balance to settle the erroneous credit, then the member has agreed and undertake to immediately return to Vikings the Philippine peso equivalent value of the erroneous credit. In case member has voluntarily revoke his Vikings Reward Program membership, then Vikings reserves the right to automatically forfeit all remaining balance points in the account. To redeem points, the member simply must present their card and/or mobile app to the Vikings employee and have their card scanned by the machine. Vikings Reward Card must be activated to enable point redemption. When redeeming, points will only be deducted from your total available Redemption Points; Reward Points will be not deducted since it’s used for status upgrades, renewal and maintenance. Points reflected online in the Vikings Reward Program shall be deemed correct and Vikings has the exclusive right to determine the points to be redeemed by the member. In the event that the Vikings Reward Card is not accepted or honored by any merchant partners for any reason, the member shall direct any complains of the said matter to the relevant merchant partners, without Vikings incurring any liability from the complain. Vikings Reward Program is a privilege granted by Vikings to its customers for their continuous patronage to the store. Other parties except by Vikings cannot render the Terms & Conditions. Failure of Vikings to enforce a particular term, condition or guideline does not constitute a waiver thereof. Vikings reserve the right to appoint agent(s) or contractor(s) to perform functions related to Vikings Reward Program, including but not related to disclosing member information. Accordingly, reference to Vikings under these terms and conditions shall automatically include such agent(s) or contractor(s). Vikings shall use all possible means to provide customers with accurate and timely information regarding the rewards program including any changes. However, Vikings will not be liable in any way for failure to do so. Release, disclose, submit, share, or exchange any member information as they may deem fit or necessary for lawful purposes, including but not limited to consumer reporting or reference agencies, government regulatory agencies, financial institutions, loyalty program partners, merchant partners, service providers or third party. Use or share with third parties the information member has provided in order to conduct internal marketing research, surveys, marketing activities, or promotional offers of Vikings, its affiliates and subsidiaries, merchant partners, and/or to develop and make offers which member may receive through email or through other means of communications. Disruption, failure, or delay with the use of the card, which is due to circumstances beyond Vikings’ control, unexpected events such as but not limited to power outages, computer breakdowns and errors, typhoons, floods, calamities, public disturbances and other similar forms of related cases. Fraudulent or unauthorized use of the card due to theft, unauthorized disclosure or breach of security or confidentiality of card information with our without member’s participation. Inaccurate, incomplete or delayed information received by Vikings due to disruption or failure of communication facilities or electronic devices. Improper, unauthorized use of the card’s facilities and electronic devices, or recklessness or accident in connection with the use thereof.